Regular visitors to my Blog and the Talkswindon Forum will already be familiar with the on-going saga of Swindons WiFi’asco but new arrivals here might appreciate a brief re-cap before I discuss the latest developments which prove to me, once again, that some Swindon Borough Councillors and one Swindon Member of Parliament will go to extraordinary lengths to protect their political ‘reputations’. In 2009 Swindon Borough Council made a loan facility of £450,000 available to a company called Digital City (UK) Ltd so it could provide a ‘Borough Wide’ Wireless internet connection to the residents of Swindon. From day one the project was plagued by incompetent management, a lack of council supervision and diligence over its ‘investment’ which borders on criminal negligence and an official attitude of belligerence towards anyone publicly scrutinising the project. By April 2010, Digital City (UK) Ltd had drawn £400,000 of the loan facility, (taxpayers money), but had not completed it’s ‘pilot’ in the small town of Highworth. Although Digital City repeatedly indicated it intended to continue ‘rolling out’ the project across the entire Borough, it never did. Spring turned into summer and summer turned into Autumn but no new WiFi transmitters appeared on any lamp posts and John ‘Rikki’ Hunt, CEO of Digital City (UK) Ltd had all but vanished from the streets of Swindon. *Apparently Mr Hunts version of WiFi does not work very well unless the landscape is billiard-table flat, but, as all Swindonians are already aware, the Borough of Swindon is nothing but hills. Most of Swindons ‘area’ names: Gorsehill, Penhill, Kingshill, Taw Hill, Victoria Hill, Windmill Hill, Blunsdon Hill, Toothill, etcetera, etcetera, bloody etcetera, tend to give the game away. Anyway, Rikki Hunt trotted off to Bathgate in November 2010 and I asked, (at the time): Will ‘Rikki Fix It’ For Bathgate WiFi Before Work In Swindon Even Starts? November 2010 was also the month that Digital City (UK) Ltd began defaulting on its loan repayments to Swindon Borough Council. Deputy Leader of the council, (and himself a Director of Digital City (UK) Ltd), Cllr Garry Perkins knew in December 2010 that his company, Digital City (UK) Ltd, was not making its loan repayments to the council yet he continued to tell people and reporters that it was making loan payments on time Busted, and Hoist upon his own petard Perkins eventually admitted his deceit when he was forced tp apologise to Des Morgan, (a fellow WiFi scrutineer and member of the Talkswindon Forum), for deliberately misleading him. But, if a Deputy Leader of a Council deliberately deceiving people wasn’t already bad enough, Cllr Perkins cabinet colleague – Cllr Keith Williams and North Swindon MP Justin Tomlinson, apparently decided that wanted to get some WiFi’asco action for themselves and both used early morning January appearances on BBC Radio Wiltshire to put the boot into local businessman, WiFi scrutineer, Talkswindon member and my friend, Chris Watts. Chris had the temerity to not only scrutinise Rod Bluh’s WiFi’asco but, after many months of aggression, obfuscation, arrogant dismissiveness and sneering contempt from Rod Bluh and his Bluhnderbirds, was so disgusted by his treatment at the hands of Swindons Conservative Council administration that he eventually joined the labour party. After Chris joined the Labour party, Justin Tomlinson MP lost no time in claiming that Chris’s criticism of the WiFi’aso was entirely politically motivated. (Tomlinson conveniently ignored the inconvenient fact that Chris had sought cross-party support in his scrutiny of the WiFi’asco and joined the labour party many months after his scrutiny of wifi had begun). At this point in time Cllrs Garry Perkins and Keith Williams, aided and abetted by Justin Tominson MP, were busily engaged in laying the blame for the failure of their wifi’asco at the feet of Chris Watts, Myself & Des Morgan. Instead of answering our legitimate questions about the wifi project honestly they orchestrated a smear campaign against us and, somewhat bizarrely, decided to include Cllr Steve Wakefield – a Labour Councillor and former Mayor of the Borough – in their despicable designs. The smear campaign reached a critical point when, on the 7th of February 2011, Councillor Perkins told Swindon Borough Council’s Scrutiny Committee that West Lothian Council had received vexatious emails and/or phone calls from a resident(s) of Swindon, and that these ‘vexatious’ communications had convinced BathGate to terminate their involvement with Digital City (UK) Ltd. 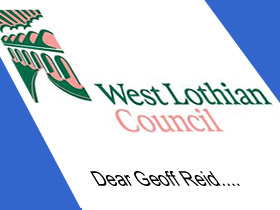 It is my understanding that Councillor Perkins then told the committee members that he had submitted a Freedom of Information request to West Lothian Council to find out who had authored/made the ‘vexatious’ communications. West Lothian Council received a Freedom of Information Request relating to correspondence between Chris Watts, Geoff Reid, Des Morgan, Steve Wakefield and the council concerning Digital City (UK) Ltd and the Bathgate WiFi scheme on 11/02/2011. Please could you supply me with details of any contacts from the following individuals and any councillor or officer at West Lothain Council with regard to a borough wide wi-fi project or Digital City Uk or Rikki Hunt between 1st September 2010 and 31st January 2011. This should request covers any written or email communications, particularly the time and date, and any transcripts or recordings if you have them. So far so good, Councillor Perkins seems to been honest about his claim to have made enquiries, but what did West Lothian Council say in response to the above enquiry? West Lothian Council has not received any communications from the individuals named above relating to the Bathgate Wi-Fi project. So, there you have it. From the horses mouth. West Lothian Council received no communications whatsoever from myself, Chris Watts, Des Morgan or Steve Wakefield. But the story does not stop there, in fact it rapidly gets a whole lot shittier…. …because, in an answer to a different Freedom of Information request, we discovered that BathGate Bid had written to Digital City (UK) Ltd in December 2010 outlining their reasons for not using Digital City (UK) Ltd. I, Chris Watts and Des Morgan know why BathGate decided not to use Digital City (UK) Ltd to ‘wifi’ their town, and I can state with certainty that Councillor Garry Perkins has comprehensively misled the public, as well as Swindon Borough Council, as to what those reasons really were. I think we’ll give Cllr Perkins one final opportunity to come clean and tell the truth before we do it for him. Again. Councillor Perkins knew in December 2010 that Bathgate were not going to use his company, (Digital City (UK) Ltd). His company had been fully appraised as to the reasons why they would not be invited to tender for the work, so one should be forgiven for wondering why he then chose to tell Swindon Borough Council, (of which he is the deputy leader), that members of the public vexatiously contacting BathGate were to blame for the failure to obtain a contract in Bathgate, and it was members of the public who were therefore responsible for causing the entire WiFi Scheme in Swindon to stall. Councillor Perkins, Deputy Leader of Swindon Borough Council and Director of Digital City (UK) Ltd, has knowingly misled the Council on multiple occasions and he has knowingly misled the public on multiple occasions. Councillor Perkins has allowed, possibly even encouraged other Councillors and one MP to repeat untruthful statements about members of the public which he knew to be incorrect, but chose not to correct them at the time and then, shamefully repeated the same untruthful statements under cover of the privileged status of Council meetings. Councillor Perkins has already broken the Code of Conduct in at least 7 different ways and, in my opinion, has brought Swindon Borough Council into serious disrepute. I do not intend to raise a complaint against him yet, but other readers might and they can find the relevant complaint form here. In the meantime I’m giving Councillor Perkins, Councillor Williams and Justin Tomlinson MP a short time in which they are invited to apologise of their own volition. This ‘short period’ will end when we decide to publish the genuine reasons Bathgate rejected Digital City (UK) Ltd.
* A forum discussion topic exists here on the Talkswindon forum – all are welcome to join the discussion. » Blog Archive » Swindons Ministry of Truth: Re-writing History of WiFi-Lies?